It's no secret about my passion for rock 'n roll tribute bands. You might say I'm a connoisseur, with the number of tribute bands that I've seen - and I've seen the good, the bad and the horrible! It is easy to just go through the motions, putting on a costume that resembles the attire that a band wore and play their tunes. But, not many tribute bands can capture the essence of a famous band. So, when I first heard about the Captain Planet Foundation's 10th Annual X-MAS Party and heard that The Return was playing, I said, "I'm there!" since they are (in my never to be humble opinion) the best Beatles tribute band around. 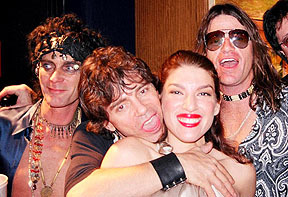 To see Rolling Stones and Jimi Hendrix tribute acts were just icing on the cake to me at the time. Guests were invited to "Experience the Event that Rocked a Decade!" with the theme being a celebration of the '60s and early '70s. Ted Turner created the Captain Planet Foundation (CPF) in 1991 support hands-on environmental projects for youth. CPF's objective is to encourage innovative projects that empower today's children as environmental stewards. CPF is committed to making a global impact with over 500 projects throughout the United States, Brazil, Bulgaria, Cambodia, Canada, Colombia, Costa Rica and the US Virgin Islands. When I arrived outside the Tabernacle, the doors had not yet opened, so I waited and people-watched as the guests arrived. The first hour was a VIP party with a celebrity meet-and-greet. Jane Fonda was one of the celebrity guests and I was hoping to get my photograph of Barbarella signed by her. The crowd outside was a 50/50 split between almost formal wear and '60s-themed costumes. This was probably one of the few times other than Halloween that you would see grown men in wigs! 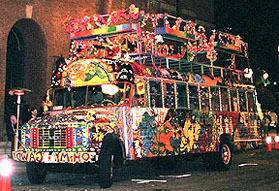 Parked outside the venue was a large psychedelic bus, which really set the mood for the evening's event (The owner of the psychedelic bus is Sue LeCraw Dunn, who was the 2003 X-mas Party Co-Chair). Once inside I just wandered around, soaking in all the cool decorations. 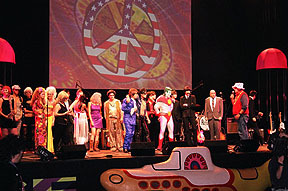 There was a giant yellow submarine in front of the stage, with various "Yellow Submarine" movie motifs around, such as the blue flying glove. Assembled on the stage were all the bands for the evening, in full costume, along with 'Ed Sullivan', 'Captain Planet', 'Austin Powers', and assorted go-go dancers. After a few announcements, this crew left the stage to mingle with the growing crowd. At this time I saw 'Jimi Hendrix' (Byron Bordeaux) and introduced myself as being from EAR CANDY and we agreed to sit down for an interview at some point in the evening. I grabbed a drink at the bar and as I turned around, there were The Beatles (The Return) talking with 'Ed Sullivan'. Very surreal! 'Ed Sullivan' is actually Jerry Hoban - straight from Las Vegas as Ed Sullivan from the hit movie "Pulp Fiction". As I was talking to him, I found it that I had seen him live before, when I saw the Fab Four in Vegas in 2001 at the Las Vegas Hilton. I was dying for a cigarette, but I didn't notice anybody smoking. I politely asked a girl that was tending bar if you could smoke in The Tabernacle (I had been to enough rock shows there where there WAS smoking, but I didn't want to commit any fauxpaux at such a ritzy event) and she angrily shot back, "NO!". I got the same reply when I asked if there was a smoking section. 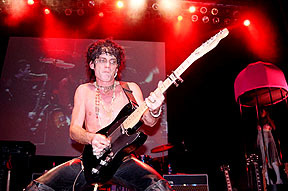 At precisely this time, I noticed 'Mick' and 'Keith' from the Rolling Stones tribute band Sticky Fingers. After introductions, I asked 'Keith', "If there is anybody in this joint that would know where I could smoke a cig, it would be Keith!" He laughed and said, "Follow me". The last time I had been backstage at The Tabernacle was when I interviewed Lemmy, and as we walked the hallway to the dressing room, I told 'Keith' the story of how Lemmy tore down some offending artwork off the wall of that corridor. And yes, the hallway was still adorned with hoaky art! Sticky Fingers was assigned the same dressing room that Lemmy had when I interviewed him and it still looked the same, with the same leather sofa and coffee table. We sat down and started to chat about all thing Rolling Stones. Soon, the rest of the band filtered back to the dressing room and we commenced with the Sticky Fingers interview. Unfortunately, by interviewing the band, I missed my opportunity to get my Jane Fonda autograph, but that's show biz! Also, The Return had started their set. We wrapped up the interview and I went back into the main crowd, where I caught the end of The Return's set. Since I had brought plenty of film, I started to get a few crowd photos. There was even a man on stilts walking around the crowd - It was almost reminiscent of the "Rolling Stones Rock & Roll Circus" from 1968, the only thing missing being the midgets and fire-eaters! The lines to get something to eat were about an hour long, so I passed, not wanting to miss any of the bands play. There was a special video-recorded appearance by Peter Max who was presenting Ted Turner with a special gift. The gift was 4 Andy Warhol-type portraits of Turner, one of which he was to keep and the others were to be auctioned off later in the evening. Turner appeared on stage to pick his choice of portraits and say a few words. Now it was time for Jimi! Right: That classic Hendrix pose! I had never seen a Jimi Hendrix tribute act before and the Mirror IMIJ Experience did not disappoint! Byron Bordeaux was simply amazing as Jimi, playing note-for-note solos, which a voice which perfectly matched that of Hendrix. 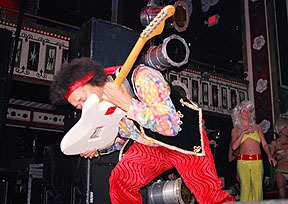 Not only is Byron a dead ringer for Jimi in his velvet pants and costume, but his onstage mannerisms were dead-on and he even did the classic Hendrix pose of playing with his teeth. One thing I did notice - Hendrix always had a reputation for being LOUD live in the '60s and while the Mirror IMIJ Experience didn't play at ear-blowing volume, they managed to pull off the illusion perfectly! The highlight of the set for me was hearing "Voodoo Chile", always my fave Hendrix tune! Of course I would have preferred a two-plus hour set to hear all my Hendrix favorites, but since there were a lot of events still planned on the stage, the songs played were most of the well-known hits. It was announced that the auction was next on the evening's agenda, so I made my way backstage to get a Mirror IMIJ Experience interview. The next music event of the evening was an "all star jam" featuring all the bands. We got a rare treat as The Return wore psychedelic Sgt. 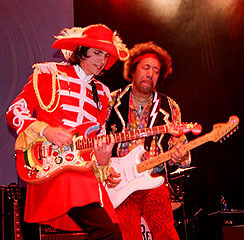 Pepper outfits (they normally perform only in the Beatles stage suits from The Beatles touring years of 64-66). It was very surreal to see Jimi Hendrix onstage with the psychedelic attired Beatles as they played "Day Tripper" (The perfect choice of a song, since there is a great bootleg of Jimi playing this live on the BBC in 1967). Sure, the actual Beatles never played live with Jimi Hendrix on stage, but it was a great "what if" scenario! And while The Beatles played some package shows with the Rolling Stones, they never shared the same stage at the same time. All that was missing was a Brian Jones look alike playing sitar! The last act of the evening was Sticky Fingers, the leading international Rolling Stones Tribute Show. Having seen how accurate the characters of 'Mick' and 'Keith' talked and looked backstage during the interview, I couldn't wait to see what they could do on stage live. Although the group was plagued with a few technical sound problems, they still gave a stellar performance. Yes, they had to play the hits (How could a Rolling Stones tribute band NOT play "Jumping Jack Flash"? ), but they also played a few lesser-known songs like "Happy". And during "Sympathy for the Devil" they even had an Anita Pallenburg look-alike playing maracas! Having seen the actual Stones many, many times, it is safe to say that Sticky Fingers is as close to a cloned replica of the real Stones as you can get. It is uncanny seeing Glen Carroll's Mick Jagger persona in action. 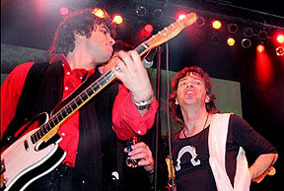 He IS Mick onstage (And offstage, too ha ha…but I digress) with voice, looks and mannerisms that are totally convincing. And with Kevin Gleeson as Keith Richards, the "Glimmer Twins" were alive and well in Atlanta on December 3rd at The Tabernacle! After the show, I hung out with Kevin Gleeson ('Keef' Richards) and we made our way to a 24-hour diner in downtown Atlanta for a little breakfast. He was still in his 'Keef' attire and I wonder how many people did a double-take upon seeing him. 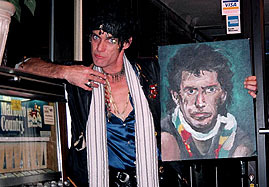 I gave Kevin a Keith Richards painting that I had (By artist Bob Taylor) because I figured that anyone that anyone that looked and acted the part of 'Keef' so perfectly deserved it! We sat around chatting among other things about the Rolling Stones until the wee hours of the morning. All in all, it was a fantastic evening, getting to see three top-notch tribute bands in one evening. Hell, it felt like the "Tribute Band Super Bowl" in a way!